Air New Zealand says its 2017 earnings won't match the $800 million it has forecast for 2016 as the airline faces increased competition and gets less benefit from foreign exchange hedging. The Auckland-based airline faces some near-term challenges that will have an impact on the 2017 results, according to an investor day presentation. It didn't quantify the impact of increased competition but said the benefit of foreign exchange hedges in 2017 will be about $120 million less than in 2016. While 2017 earnings "will be solid" they won't be at the level of 2016, it said. Its forecast for 2016 pre-tax earnings, excluding the contribution from Virgin Australia, given with the first-half results in February, build on the record $457 million the company earned in the first half, which was driven by lower fuel prices and a jump in passenger revenue as the airline added new routes and refurbished is fleet. 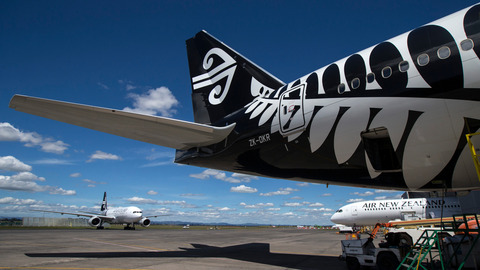 Air New Zealand said increased capacity in the industry was driving "significant growth of seats across the network" and it expects "headwinds to overall yield as (the) market adjusts to new capacity". Against that, it expects to continue to benefit from growth in inbound tourism, a favourable outlook for fuel prices and the scale of its fleet. The airline is halfway through a $2.2 billion capital expenditure programme to add new aircraft, reduce the age of its fleet and cut back on the variety of planes it operates. It expects to have reduced the average age of its fleet to 6.7 years by 2018 from 8.6 years in 2012. It will be made up of the wide-body B787, B777s, the narrow-body A320 and the ATR762s and Q300 turboprops, reducing the fleet types by three to five in total. Its gearing rose to 52.4 percent in 2015 from 42.9 percent the previous year, and it aims to keep gearing in a range of 45 percent to 55 percent, it said today. The increase reflected investment in its fleet and a stronger US dollar. Air New Zealand has been reviewing its ownership of Virgin Australia and stopped equity accounting the investment on March 30, with changes in fair value now recorded in its profit and loss statement. Virgin is also reported to be cutting back route frequency, while the Australian national carrier has also warned of a softer outlook for Australian domestic aviation. The shares last traded at $2.51 and have declined 15 percent this year, partly reflecting rival Qantas Airways' decision to trim its expansion plans in response to weaker demand.